Igloos aren't just for eskimos, they're popping up all over London this Christmas. From saunas to Sliders, curling or curling up in front of a log fire, London has a festive pop-up for you. 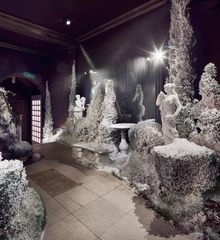 Six immersive installations make Christmas at sketch a must-see. Not one or two, not even three or four, but six immersive installations make Christmas at sketch a must-see. It starts before you even set foot inside the building, with The Nutcracker setting the theme for the facade. Pass under the candy covered arches and discover the Christmas Day Walk - a snowy cottage scene with 'real' snow falling onto Greek statues. Before you enter The Glade, where you'll be greeted by ceiling covered in mistletoe created by Rebel Rebel, artist Dianne Harris uses a hologram to retell the pagan Christmas story. Enter The Glade and you'll spot lights among the hanging florals, these illuminated columns by Tala take inspiration from the Giant's Causeway. Through the pink parlour to the sketch loos - well, you wouldn't want to miss them - in a stroke of genius, they've wrapped up the egg shaped pods like Christmas presents, with ribbons and bows on top. If you're lucky enough to make it upstairs to the two Michelin starred Lecture Room & Library you'll see Tony Marklew's 'The Christmas Spirit' - a five metre gold and silver tree adorned with ornaments representing the virtues of peace, giving, joy, love and reflection. The whole thing is a marvel and a joy. The courtyard garden at the Langham is transformed into a rustic winter hideaway. Tucked away within the interior of the Langham hotel, the courtyard garden has been transformed into a rustic winter hideaway where you can enjoy special seasonal cocktails and French food. Settle in underneath the Christmas tree adorned with lights or get cosy under blankets and sip on warming mulled wine and Grey Goose cocktails. Festive food straight from the fire delivers a feast of pomme de terre and warmed Vacherin Mont d'Or - perfect for sharing. Visit the French Winter Village and you'll leave feeling like you've escaped to an exclusive French winter wonderland, without leaving London. A wooden ski chalet, conifer trees and a canopy of lights brings winter to the square. Conifer trees, a canopy of lights, two bandstands and heated areas give Flat Iron Square a winter makeover. Nestled amongst the pines, the Apres London wooden ski chalet, brings the on-site bars to four, alongside Omeara Cantina, The Flat Iron Square Bar and 'on tap' wine bar, Tap & Bottle. Warming drinks are served at all the bars and you can visit a sweet shop, bakery and wine merchants with immersive shops fronts. Book in for two hour wreath making classes on 5th, 11th and 19th December and you'll get a free glass of Prosecco thrown in. The regular weekend Flea Market gets more a festive feel as December approaches and there's a special Christmas market on Saturday 15th and Sunday 16th December. Expect carollers, mulled wine and a brass band, as well as a closing Christmas party in December. Dine in your own personal snow globe alongside the Thames this winter. Dine in your own personal snow globe alongside the Thames this winter. The four glass igloos are part of Jimmy's Lodge On The River created by Jimmy Garcia of Jimmy's Pop Ups fame. The igloos have been given a new look for 2018 and can be booked for 6-10 people to a set menu of winter warming dishes while overlooking the Thames. Feast on home smoked mackerel rillettes, smoked Scottish venison tartare and traditional alpine fondue. For the ultimate feast, choose from the steak share, 600g of flat iron steak cooked on a hot stone. An alpine foodie retreat, Jimmy's Lodge also serves a fondue menu at 'The Refuge', upstairs in the first-floor wooden ski chalet style lodge restaurant. In addition, there's a more accessible grab-and-go menu of street food from the Winter Grill downstairs, so you can eat as you stroll along, taking in the winter market and views over the river. The Lodge will also be open for New Year's Eve, with an alpine feast, unlimited drinks and a view of the fireworks. The original riverside igloos with views over the Thames, Tower Bridge. The instagram hit, Coppa Club's igloos along the Thames are back and this year they're even better. They've been re-designed by Coppa Club's design manager, Theresa Obermoser, as timber frame structures with Perspex sliding doors, all fully furnished enclosures with heating, blankets and speakers. Serving a Christmas menu from mid November, these cosy igloos make an ideal venue for Christmas lunch with a festive feel. Last year they sold out within 48 hours, so be quick. Bookings are live from Tuesday 9th October. Decorated with pine trees, snowmen, ski racks, piste maps and strings of fairy lights. 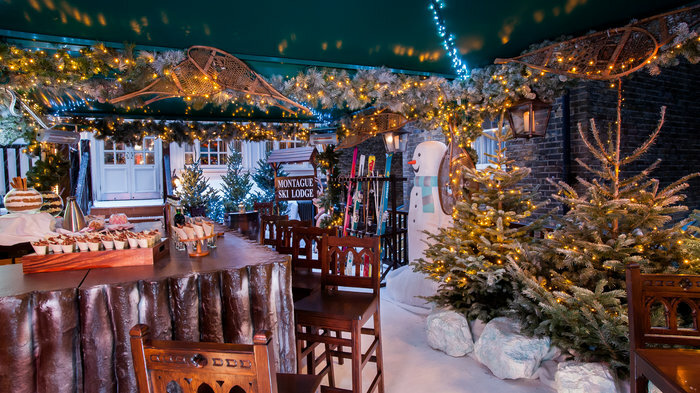 Add some festive sparkle to your Christmas celebrations this year with a visit to The Montague Ski Lodge at The Montague on the Gardens. From mid-November the area is transformed into a world of pine trees, snowmen, ski racks, piste maps and strings of fairy lights - perfect for allowing you to imagine you're on the slopes in Austria or France. A 'ski pass' gets you an hour's access and a seasonal spread of food including a mini turkey schnitzel, mini bratwurst and deep fried camembert (vegetarian options are available too); plus a choice of three festive drinks from the Ski Lodge bar menu. We're talking flavoured schnapps and vodkas, mulled wine and hot 'choctails'. If you're looking for a more intimate escape you can cosy up in the separate Log Cabin area which has a decorative fireplace, armchairs, blankets, bar snacks and festive themed drinks. Book a personal 'ski pass' or hire the area for a group Christmas party. 300 snow-covered pine trees, twinkling lights and festive weekend workshops in Broadgate. A fairytale pop-up, The Winter Forest, comes to Broadgate Circle this winter with 300 snow-covered pine trees, twinkling lights and festive weekend workshops. In Exchange Square, Kevin Killen's Senses of Light creates a light and neon installation. Back at Broadgate Circle, the new Mrs Fogg's Winter Terrace is the place to go for special festive menus and cocktails like hot butter rum and mulled wine. It has Christmas carol singalongs every Wednesday except for 7th November, when The Brass Funkeys, an 8-piece, kicks things of in style for the official launch. Drop in weekend workshops cover everything from making fairy lights using origami to children's Christmas cards and wreath making. Wintery lodges, igloos and fur lined sofas at Fulham's Thameside pop-up. Neverland London returns for winter with a brand new theme, bringing the Alps to London and there are bauble filled igloos and firepits to keep you warm. Retro gondolas and chairlifts help turn Fulham's Thameside food court into a ski resort as Winterland transports guests back in time to the Alps in the 80s and 90s. Jimmy's Lodge is in charge of the food, serving wood fired, sourdough pizzas with festive toppings, fondues and schnitzels, best enjoyed in the warmth of a heated winter lodge and washed down with some mulled wine. You can also sip on winter warmer cocktails from the comfort of the fur lined sofas. For those more playful moments, a karaoke booth, curling lanes, beer pong, putting pong, table tennis and more can be found within Fulham's very own ski resort. Tobacco Dock's Skylight brings mulled wine, fondue and London's first rooftop ice rink. From 1st November 2018, Skylight gets a winter makeover with rooftop ice rink, cosy igloos and huts on top of Tobacco Dock . The winter season brings h eated apres skate bars, draped in glimmering lights, serving warming winter cocktails, mulled wine as well as beers and ciders. Set on the top three levels of a former car park in Wapping, the 600 capacity Skylight has multiple bars, indoor and outdoor seating areas, and two street food stalls, all set against some of the finest views in the city - you can see The Shard , The Gherkin and the Walkie Talkie from here. Food wise, Raclette Brothers are bringing their signature Alpine treats with copious amounts of melted cheese and Yiro return with a seasonal menu. DJs, seasonal events and parties add to the offer with New Year's Eve celebrations sponsored by Moet et Chandon and a Burn's Night Ceilidh in January fuelled by Monkey Shoulder whisky drinks. The Chelsea venue is transformed into a winter wonderland for the festive season. This winter, Bluebird Chelsea is getting into the festive spirit with three heated wooden chalets spaced around its courtyard. The entire space will be transformed into a magical Narnia wonderland with snowy Christmas trees, pine cones and lanterns while the chalets will be a warming retreat with velvet and faux-fur cushions, throws, festive wreaths and twinkling lights. A winter warming menu of fondue, apple pie and boozy hot chocolate will be available in the chalets along with special seasonal cocktails. Inside, the White Witch may well be spotted amongst the Christmas trees and a special menu of baked vacherin with warm potato, toasted hazelnut salad and Perigold truffle and braised duck leg with pomegranate, sherry and winter greens will be served. A tropical pop-up to celebrate 25 years of Cool Runnings along with winter warming street food and hot toddies. On top of a multi-storey car park in Stratford Roof East is back for winter 2018, celebrating the 25th anniversary of classic film Cool Runnings. Putting a tropical twist on the winter months, Curl Runnings is ideal for anyone who's not quite ready to say goodbye to summer. The aptly named pop-up will see the return of Sliders - London's first ever curling spectacle - with neon lit lanes available to book along with lane-side cocktails and icy libations. Sticking to the theme, there's also a boating seating area and a bobsleigh or two. For a more traditional taste of winter, try the street food from Jimmy Garcia, including the Lodge raclette burger, a venison hot dog, crispy chicken schnitzel and proper cheesy chips. The winter bar, meanwhile, offers hot toddies like boozy hot chocolate and apple strudel mojitos. A great spot for a sundowner, the views over east London are pretty good from up here - you can see all the way to the Olympic Park with the red, looping curls of the Orbit rising above it. This pop up on the Orrery rooftop is decorated with frosted fir trees and fragrant pine cones. Perched atop the roof of the converted stable block that houses Orrery, the Marylebone restaurant originally designed by Sir Terence Conran, is an alpine retreat, installed especially for the festive season. Taking inspiration from the rustic chalets that dot France's mountain slopes, the Les Alpes terrace is surrounded by frosted fir trees and planters over-spilling with fragrant pine cones. Olive trees are decorated with twinkling baubles while sheepskin rugs, blankets and fur cushions keep you warm. Hot Winter Spice cocktails go well with French charcuterie from the Rhone-Alpes, quail egg and a winter truffle vinaigrette. Sirloin steak is served with a gruyere fondue sauce comes with pomme cocotte and to finish, a hot baked apple flavoured with winter spices and raisins is topped with a scoop of apple sorbet. A cosy tipi brings a warming fire and Christmas activities to Regent's Place. Bringing a cosy tipi and Christmas activities to Regent's Place, The Winter Retreat pops up at the plaza, part of a 13 acre site by Warren Street station. Head to the tipi for live music, craft classes, quizzes, board games and community events around the fire as well as food and drink to get you into the Christmas spirit. On Tuesday evenings you can learn a new craft at workshops - why not try making your own terrarium? Wednesday evenings bring themed quiz nights and on Thursdays and Fridays there's live music. Weekends are for community events and you can play board games round the fire pit any day of the week.